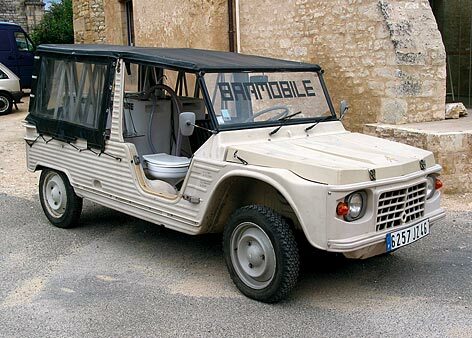 BARMOBILE, Méhari version 2003. Sounding the horn of the Méhari (3 long signals) announces that the bar is open. One long signal closes the bar. 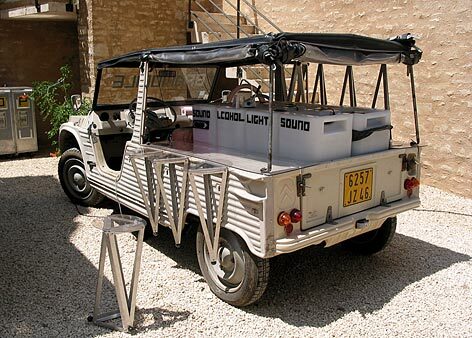 Music for BARMOBILE by Anders Remmer. BARMOBILE is a mobile non-profit bar that enables persons to establish a bar in local situations, have a drink, meet, listen to music, etc., in any place they find suitable. 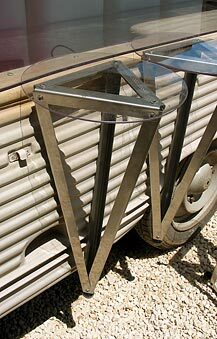 It can be carried, mounted on a cart, in a car, on a bicycle trailer, or be transported in other ways. The BARMOBILE is constructed from prefabricated plastic tanks that are modified to perform basic bar tasks. In addition, a toilet is available. These functions constitute the main BARMOBILE module. This module, which fits the EUR pallet standard, can be transported by different means. BARMOBILE. Music by Anders Remmer. A car radio and two water resistant loudspeakers make up the sound system. A special soundtrack was made for BARMOBILE. One can also bring other audio CDs. The alcohol dispenser can be filled with wine or drink mixtures of different sorts. If the adjacent water container is filled with fresh water, the water will keep the contents of the alcohol dispenser cool for a long time. The light is switched on next to the loudspeaker at the sound module. Inside the waste collector there is an exchangeable plastic bag. It is important not to put any cigarettes or ashes in the waste container. Money for drinks can be put through the hole in the tank. BARMOBILE is a non-profit bar. The cost of the drinks should only cover the cost of running the bar: refill of drinks, plastic cups etc. Water is refilled through the large hole. The contents of the water container mixed with urine must not exceed what can be contained in the urine collector. 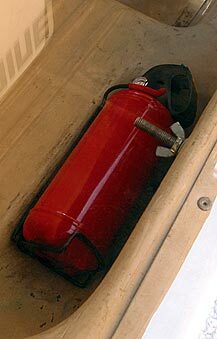 The contents of the urine tank (urine and water) can be used as fertilizer because of its high content of nitrogen. The battery runs the light and sound system for approximately twenty-five hours. It has to be recharged after this. Toilet, mounted in place of the passenger seat (Méhari version). 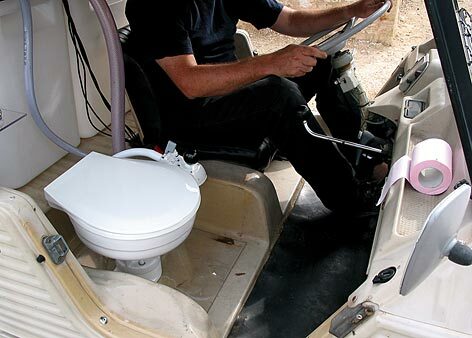 If the BARMOBILE is installed in a car, the toilet can be mounted in the place of the passenger seat. In a non-car BARMOBILE situation, the toilet can be placed directly on the ground. It is important to follow the instructions on how to use the toilet. For hygienic and practical reasons, it is intended for urinating only. The toilet is connected to the water and urine containers. After urinating, one pushes the handle next to the toilet seat to the left, and the toilet will be filled with water from the water container. After pushing the handle to the right, the toilet can be emptied using the hand pump. Leaving the handle in the left position may cause the toilet to overflow. The bar stools can be used alone or in combinations with tables. When not in use, one end of the seat can be inserted under the bar counter (Méhari version). When the BARMOBILE is transported, the bar stools and tables are standing upside down on the counter or are inserted under the plastic tanks. When the bar is closed, the bar stools and tables can stand upside down on the counter (Méhari version). Refrigerators and other equipment can be built into the system provided one has access to a stable supply of electricity. 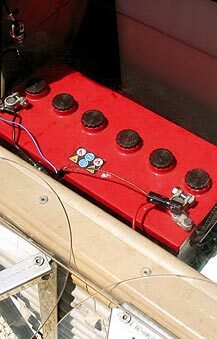 When BARMOBILE is implanted in a car, the engine of the car can be modified to run on alcohol avoiding the use of fossil fuel. BARMOBILE can be used by anybody for non-commercial purposes Those who open and run the bar provide drinks and refill glasses and water. The price for drinks should cover the direct costs of running the bar only. Visitors to BARMOBILE are also welcome to bring their own drinks, food, etc After use, the counter must be cleaned with a moist cloth, and the waste and urine tanks must be emptied. 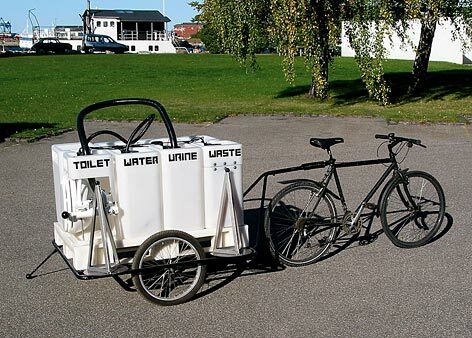 The contents of the urine tank can be used to fertilize soil The person who borrows BARMOBILE is responsible for bringing it back in the same condition. It is strongly recommended that anybody who uses BARMOBILE read the manual carefully. The liquid tanks must be rinsed and the bar stools and tables must be wiped with a moist cloth. The toilet must be cleaned as needed. 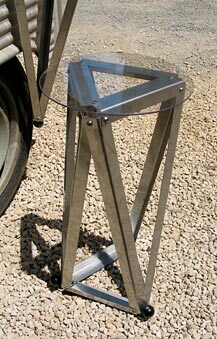 Bar stools: 6 pc struts in stainless acid resistant steel, 70°, lengths 20 and 56.5 cm, 3 mm polycarbonate discs Ø 28 cm. Porcelain toilet (boat type), manual flush control and self-priming pump. 2 pc counters of 3 mm polycarbonate, length 134 cm, width 37 cm. BARMOBILE, cart version with bike.